Boss Tweed Had It Right -It’s Those Damned Pictures! “Boss” Tweed, the corrupt Tammany Hall politician who ruled New York City in the 19th Centurey had it right. “Let’s stop those damned pictures, ” he said referring to cartoonist Thomas Nast’s drawings about him in Harper’s Weekly. Yes. Look at this picture. A little girl from Honduros crying as her mother is taken away for screening at the U S border with Mexico. Look at it Donald J Trump and tremble. Remember the little Vietnamese girl running screaming across a bridge as Napalm dropped from a U S warplane burned her back. Remember the young man hands bound in a suberb of Saigon as General Loan took his pistol and at the moment Eddie Adams snapped the picture blew the young man’s brains out. Remember the picture of the young Kent State student kneeling in tears over the body of a fellow student shot down by the National Guard of his own country. What do we remember about Vietnam. And now, remember the pictures of a smiling, joking president as he fawned over one of the World’s most brutal, murderous dictators in luxurious surroundings and put those pictures against this one of this little frightened girl from Hondurous crying for her mother. Yes, “Boss” Tweed, it’s the pictures that indeed brought you down. 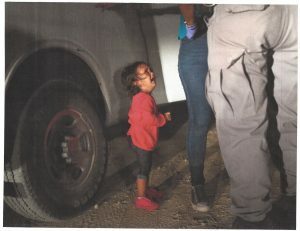 And you, Donald J Trump, you poor, pathetic example of a shrunken human being, it is the pictures which will force you to back down, to change this heartles policy for which you, and you alone, are responsible. Rage against them, blame the democrats, Hillary, Barack, Canadian Prime MinisterTrudeau, the news media, blame me! But as the Chinese once said “A picture is worth a thousand words” and you can’t “tweet” them down. This time your lie won’t stick. Even some of your Base which usually slavishly follow your every word with nodding devotion have a heart for children crying for their mother. No, it is you who chose to implement this cruel policy of seperating children and parents on our Sothern border in order to secure leverage for an immigration bill that would put our Country to shame, that would say to the world we are no longer the haven for the weak and oppressed, the “tired and poor, the huddled masses yearning to breathe free” but a Country bent on building a wall, a “beautiful wall” as you like to say. And for that you would separate young children from their mothers and fathers. Well, Donald J Trump, this one thanks to the pictures – and many more are on their way – is one you can’t win. Next PostNext Knife Fight In The Back Alley, Democrats. Do You Play Or Fold?